H Liu, J Li, Y Yuan, L Yu, Y Wu, Y Chen, Q Yang, Y Guo. Catheter Ablation Of Idiopathic Ventricular Tachycardia. The Internet Journal of Cardiovascular Research. 2001 Volume 1 Number 1. Objectives: To describe the techniques and results of catheter ablation of idiopathic ventricular tachycardia (IVT). Methods: Radiofrequency catheter ablation was attempted in 11 patients with IVT of 2-15 years. Both activation and pace mapping techniques were used to locate the VT foci for ablation. Results: IVT was originated from the left interventricular septum in 5, right ventricular outflow tract in 5 and right ventricular free wall in 1. All VT was successfully ablated with the procedure time ranged from 60-120 min and total energy delivery time of 90-150 s. There were no complications during and after the treatment. There was no recurrence after a followed-up of 6-24 months without antiarrhythmic drugs. Conclusions: Radiofrequency catheter ablation is a safe and effective curative therapy for IVT. Idiopathic ventricular tachycardia (IVT) accounts for about 10% of the VT. IVT is usually associated with a benign prognosis and causes minimal hemodynamic compromise.1 Radiofrequency catheter ablation has been used to manage VT with a higher curative rate for IVT.2 In this report we described the methodology and long-term results of IVT ablation in 11 patients. Six male and 5 female patients aged between 35-56 years underwent catheter ablation of IVT in our hospital. All patients had recurrent VT for more than 2 years (ranged from 2 to 15 years). In 3 patients, a single episode of VT lasted as long as 5 days without pharmacological intervention before the ablation. The major symptoms of IVT include palpitations (11 cases), dizziness (11 cases), chest pain (1 case) or syncope (1 case). Physical examination, resting ECG, chest X-ray and echocardiography revealed no pathological changes of the heart. The blood pressure during VT attacks in these patients ranged from 80-110/40-60 mmHg. During the VT episodes, 6 showed right bundle branch block (RBBB) morphology and 5 were in the form of left bundle branch block (LBBB). Esophageal ECG was performed in all patients showing atrioventricular dissociation during VT.
After acquisition of surface ECG, the right jugular vein and the femoral veins of both sides were canulated. Six French quadripolar electrode catheters were sent to the coronary sinus, right ventricular apex and bundle of His via the intravenous sheath. Programmed intracardiac stimulation was routinely performed to exclude supraventricular tachycardia and also to terminate or induce VT.
For IVT of the left ventricular origin, a 7 French Webster ablation catheter was sent to the left ventricle via the right femoral artery. Attempts were made to map the arrhythmic foci under sinus rhythm trying to locate a P potential, which is usually 10 ms behind His potential recorded by the quadripolar electrode catheter in the right atrioventricular junctional region (Fig 1). If the mapping was undertaken during VT, the ablation was targeted on the site where a P potential that was 20ms earlier than the QRS complex on the body surface ECG was recorded. For the right ventricular VT, the Webster ablation catheter was inserted to the right ventricle via the right femoral vein. Pace mapping was used, commencing from the right ventricular outflow tract. Fig 1: Intracardiac mapping of left ventricular IVT during sinus rhythm shows a P potential (arrow) at left interventricular septum. Ablation at this site rendered VT noninducible. RF: ablation catheter; RV: right ventricle; CS: coronary sinus; HBE: His bundle recording; HRA: high right atrium. Radiofrequency energy of 20-30W was delivered to the target site. If ventricular ectopics similar to VT in morphology were induced during the energy delivery, then the ablation of the site was continued until the elimination of the ectopics. After each successful ablation, isoprenolol was administered (1-5 g/min, iv) until the heart rate was increased by 20%. A programmed stimulation was performed to induce IVT. The ablation procedure was terminated if no VT was induced. The ablation results of the 11 patients were summarized in Table 1. Successful ablation was achieved in the right ventricular outflow tract in 5, right free wall in one and left inferior region of the interventricular septum in 5. Table 1. Radiofrequency catheter ablation of idiopathic ventricular tachycardia. RVOT: right ventricular outflow tract; RVFW: RV free wall; LV: left ventricle. In the 5 patients with left ventricular tachycardia, catheter ablation was achieved during incessant VT episodes. A P potential was registered at all successful ablation sites and the average time interval that the P potential preceding the QRS complex on surface ECG was 30.5+0.5ms. The right ventricular tachycardia was located by pace mapping and was ablated during sinus rhythm. There were no complications during and after the ablation procedures. All patients were discharged 3-5 days after the ablation procedures without any antiarrhythmic drugs. No recurrence was found after 6-24 months follow up. IVT-induced hemodynamic changes are less dramatic than those as a result of VT of organic heart disease, such as cardiomyopathy or myocardial infarction.1 This rather begin nature of IVT allows time for activation mapping and therefore, catheter ablation. The success rate for IVT ablation is higher than that in VT caused by ischemic heart disease or cardiomyopathy.2 The key for a successful ablation of IVT is the timely and accurate identification of tachycardia foci. Because most IVT are originated from the left ventricular interventricular septum or the right ventricular outflow tract, 3, 4 it is logical that these areas should be mapped with the ablation catheter in the first instance. It appears that an activation potential (e.g. P potential in this study) during incessant VT is a useful marker for successful ablation of IVT originated from the left ventricle. The downside of this activation mapping approach is that if the VT is terminated by the ablation, the position of the ablation catheter may be moved due to the sudden reduction in heart beat, resulting in insufficient energy delivery to the target site and hence, recurrence of VT.
1. Ohe T, Aihara N, Kamakura S, et al. Long-term outcome of verapamil-sensitive sustained left ventricular tachycardia in patients without structural heart disease. 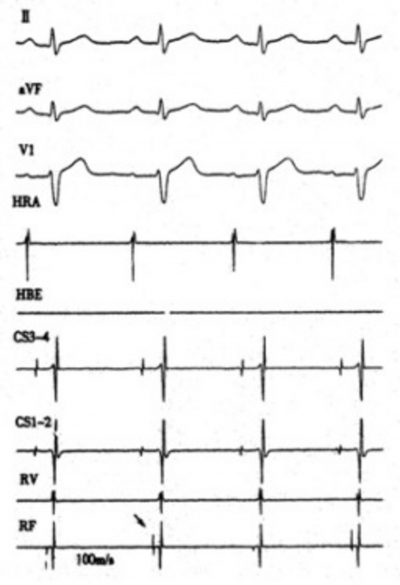 J Am Coll Cardiol 1995; 25:54-58. 2. Scheinman MM, Huang S. The 1998 NASPE prospective catheter ablation registry. Pacing Clin Electrophysiol 2000; 23:1020-1028. 3. Peeters HA, SippensGroenewegen A, Wever EF, et al. Clinical application of an integrated 3-phase mapping technique for localization of the site of origin of idiopathic ventricular tachycardia. Circulation 1999; 99:1300-1311. 4. Rodriguez LM. Smeets JL. Timmermans C, et al. Predictors for successful ablation of right- and left-sided idiopathic ventricular tachycardia. Am J Cardiol 1997; 79:309-314. 5. Chinushi M, Aizawa Y, Takahashi K, et al. Radiofrequency catheter ablation for idiopathic right ventricular tachycardia with special reference to morphological variation and long-term outcome. Heart 1997; 78:255-261.